Developed by UK studio Futurelab, Velocity 2X is the sequel to Velocity Ultra, the remake of the original Velocity which was a PS Mini title on the PSP. In the game you play as Lt. Kai Tana, a former test pilot turned cyborg who was flung halfway across the galaxy and captured by the evil Vokh empire. After escaping thanks to a fellow prisoner and slave named Hjun Ralan the third, the two of them work together to try and find the Quarp shield in order to send Kai back to Earth where she belongs. All the while General Glaive, the ruler of the Vokh empire, and his armies of Vokhs attempt to hunt down Kai and Hjun and eliminate them once and for all. The story is your typical science fiction fare, but the beautifully draw static cutscenes and the unlockable diary entries from Kai give the game a surprising amount of depth, especially considering that the story is mostly there to keep the action going from one place to the next. The effort from Futurelab was noticeable and appreciated and I really grew to care about Kai and Hjun throughout the entirety of the game. If you’ve never played a Velocity game before, it’s basically a top down vertical shooter in which you are always moving up and the screen is always moving down. 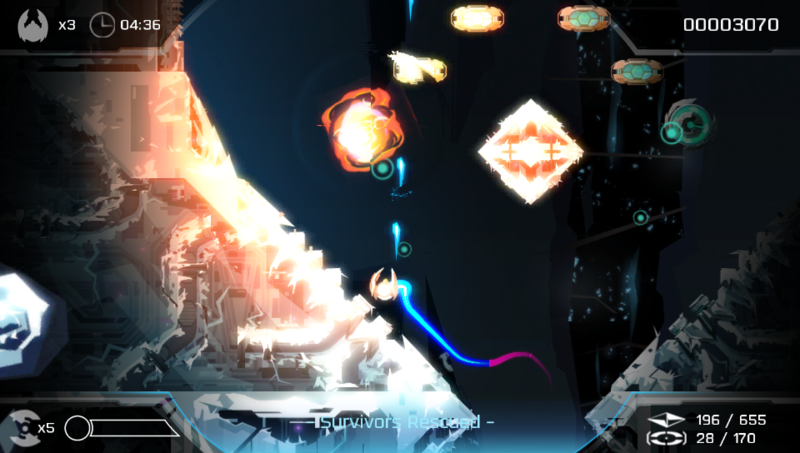 You shoot enemies, collect survivor pods, hit switches and teleport through barriers. It’s super frenetic and and fast-paced and if you’re not careful you could be dead within seconds on some of the later levels. It’s a case of easy to pick up, difficult to master and any fan of stylistic vertical space shooters should feel right at home here. It has a great arcadey vibe, and has enough variety in terms of power ups, upgrades and new skills to unlock as to never get boring. 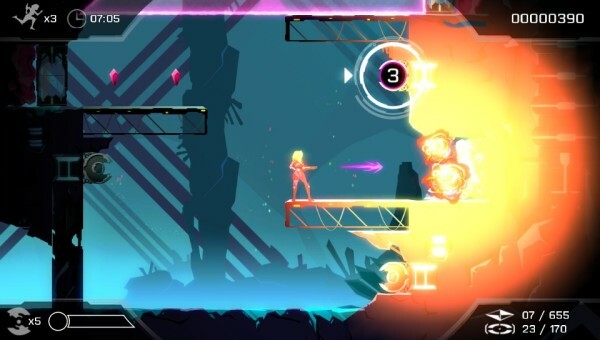 What sets apart Velocity 2X from it’s original counterpart is the newly added 2D side-scrolling sections. That’s right, now you can take Kai out of the ship and have her running around solving puzzles, collecting items and teleporting from one place to the next. The controls don’t change at all, which was a worry I had going in, so the fast-paced non-stop action of the ship sections translates perfectly over to the platforming sections, just now without the ever scrolling screen. The actual mechanics during these sections were some of the best platforming I’ve experienced in some time and they switch back and forth with enough frequency as to never get bored with any one section. The game is highly replayable and one that I’ll find myself going back to for some time. While the main campaign can run you about six hours, the amount of levels and the things you can collect is almost astronomical in size. On top of that you earn a medal every time you finish a level based on what all you collected and how fast you got through the level. Getting the perfect run is going to take you some time and it’ll be something near impossible for others in the later levels. It warrants going back and replaying multiple times until you get it just right. The game is available on the PS4, but there is a Cross-Buy function with the PS Vita version, so if you ever want to take the game on the go, you can. The transition is seamless and you can go from playing one platform to the other in a split second. It’s a great feeling and a great job by Futurelab for including that. 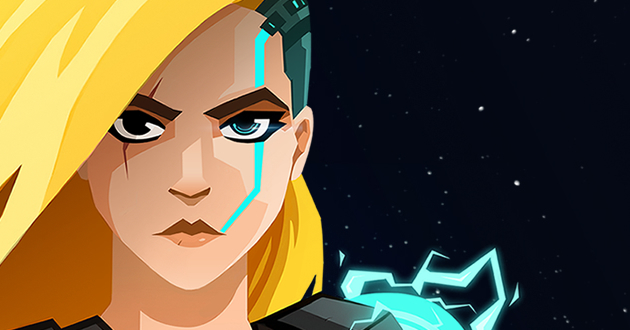 Velocity 2X is the kind of sequel everyone wants to see. Improved graphics, improved gameplay, a better story, tons of replayability and a cross-buy function that allows you to play the game anywhere you go. If you love classic vertical shooters with a modern sci-fi twist and fast paced 2D platforming, than this is about as good a game as you’re going to get.